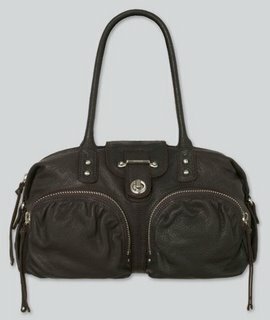 The first of three Holiday Gift Guides is now posted on BagTrends.com. No more tools for dad. No more picture frames for mom. Liven up your holiday shopping list and really explore what’s out there. We’ve scoured the internet to find dazzling goodies that will even warm up your scrooge of a boss. From aligning your best friend’s chakra to giving your husband something he really wants, this is a gift list unlike any other! Happy shopping. The Socoley small bubble bags are flying out of the BagTrends shop. We're almost sold out in a few colors. This is a unique evening bag with great rouching, the signature Socoley gold symbol on the zipper and tons of space for essentials. Sometimes we can only indulge in a little bit of luxury. After all, how many gals can afford an Hermes bag - of any kind!? If you want to accent your arm candy with some lux, pick up an Hermes silk twilly. Wrap the silk ribbon around your contemporary designer satchel or shoulder bag to add some classic glamour to your modern bag - it's the perfect meshing of PAP (park avenue princess) and Tribeca trendsetter. The orange twilly is the best purchase if you're looking for iconic, unmistakable-from-a-mile-away Hermes style. Here are some handbag suggests (of course) that will complement the Hermes ribbon. If you're looking for a unique evening bag that works at a holiday bash in the city and a summer fiesta in the Hamptons, this limited-editions clutch from aGain NYC is perfect. Wear it now with a red jersey dress. Wear it later with Alice+Olivia white pants and orchid-print blouse from Valentino. There's something about the holiday season that makes me crave shiny accessories. I spotted the Anya Hindmarch Woven Leather Clutch in the companies window display in SOHO and I can't get it out of my mind. The woven metallic leather has a nice amount of texture and the side tassel is a fun detail. Celeb fans of this British brand include Sienna Miller, Jessica Alba and Scarlett Johansson. In BagTrends land, vintage is a rare bag with history and charm. It could be a hard-to-get aged Chanel 2.55 5quilted purse, or a shagadelic Jerry Terrence carpet bag circa 1960's, or something passed down to you from a devilishly stylish grandmother! It's classic Cavalli to feature a wild animal like the serpent. This gold serpent wraps around a gold leather clutch that is intricately beaded to create that vintage vibe. 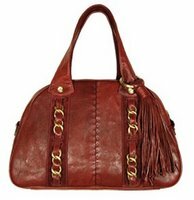 For added elegance, there's a detachable chain handle so you can wear it as a clutch or shoulder bag. If you're off to a holiday gala that is black tie and crème de' le' crème chic, pair with a Cavalli gown. If you're going to a slightly less ritzy affair and you want to play up the bag (as you should!!) pair with a red dress. Support our sponsors and visit Yoox.com for your holiday shopping needs. The synched leather and contrast patent leather stripes with laced strap detailing. The oh-so-classy push-lock accent. The unmistakable, downtown chic vibe. What's not to love in the Marc Jacobs Hudson Striping Bag? The price - $1,275. Not that MJ isn't worth it!! But, if you're looking for a similar look at a fraction of the cost (and you don't want a cheap knockoff) check out the Sobella Ivy bag. 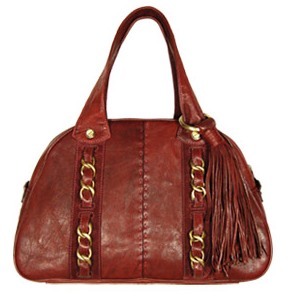 It's made with high-quality Italian leather and antique brass hardware. As with many Sobella bags, there's a removable tassel that can be used as a key chain. 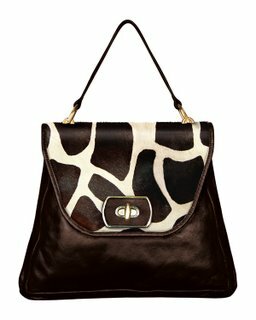 Now through Dec 8th, save 15% off of all handbags at the BAGTRENDS.com SHOP. Indulge your inner diva and your pick up a luxurious Andrea Bruckner python hobo customized to your specifications (WAS $2,195 NOW $1,865). Or, get a unique Renato Minelli laptop tote for you fabulous sister (WAS $299 NOW $254). And what stylish mother would love the new Jerry Terrence Jacqueline Tote (WAS $495 NOW $420). A brighter version of it's older brother (Damier Canvas), the Damier Azul Collection is a great treat for the holidays. The checkerboard pattern looks divine in winter white and blue. Staying in the city for the holidays? Pair the Damier Azul Pouchette with of-the-moment skinny gray jeans and a fabulous white babydoll. If you're off on a fabulous escape don't forget the Pampelonne PM - too yummy for words. It's not available on eluxury yet, so head over to the nearest LV store. Here's some celeb scoop straight from London. Who: Say what you will about Victoria Beckham, but her vixen-like fashion sense is second to none. Her handbag collection is also something to marvel at. Hermes, Gucci, Prada, this bagista doesn’t discriminate – and we love her for it! What’s her newest poison? PS: Don’t think this bagista didn’t notice those fabulous Christian Louboutin peep-toe pumps!! So divine. It's Monday and that means "Dear Bag Guru" time. I am going to a wedding in Mexico and I am not sure what bag to wear. The invitation did not any rules and the bride said we should feel free to dress as we like. I plan to wear a floor length, chiffon Diane von Furstenberg dress that has hints of beige, pink, orange and light red. What bag should I take? READ ON for my tips.